Jesse James was one of history's most well known criminals. He was a vicious man and led a long life of crime. James was born September 5, 1847 in Kearny, Missouri. His father was a Baptist minister and his mother was Zerelda James. She did not work. Throughout James's life he had several father figures, but little guidance from his own father. His mother had remarried twice by the time James was 8. He had two step-brothers, two step-sisters, and two natural brothers. James had wanted to join the rebels' cause for much of his teen life. He was too young to join when he first became interested, but by 1862 he had joined Quantrill's Raiders. During his involvement with them he fought at Centralia Massacre in 1864. Soon after this James formed a gang. The gang consisted of people that wanted to get money the easy way, by robbing banks and trains. The very first bank robbery attempt failed and had many casualties. This robbery was at Liberty Missouri in February of 1866. There were several banks after this that were great successes. Jesse James was the mastermind behind the successful plans. He knew the layout very well and knew how to scare the people they were robbing. 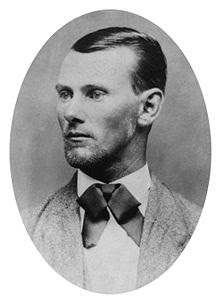 Jesse James had married his own first cousin, named Zerelda after his mother, after a nine-year courtship. They had two children, Jesse Edwards and Mary. She and Frank James' wife tried to get the brothers to take on a more normal life, and with a $10,000 reward on his head, Jesse and his wife moved to Saint Joseph, Missouri to hide out, where he lived under the assumed name of Tom Howard and rented a house for $14 a month.